Why the Uninterruptible Power Supply is (UPS) so important for your valuable devices? If you do not have a proper Uninterruptible Power Supply (UPS), the one thing which is sure is that you will lose plenty of money. Your investment on UPS is perhaps one of the most important one you will make when you purchase a computer. The reasons for this are many. The investment on your UPS, will not only protect your hardware investment, but will also prevent data loss; increasing user productivity. We at Matrix Service have been dealing in UPS Repair Services since long. Thus we understand the importance of the proper functioning of the UPS and thought it would be a good idea to share with you some important facts with you in this regard through this blog. Lightning often may strike against power lines and electrical substations. These in turn can cause substantial damage to electrical equipment, even to domestic and commercial users located at great distances away. However, many spike, surges and noise occurring every day in homes and offices. All these can have the same devastating effect on your computer hardware and software equipment. The damage can be as devastating as a lightning striking them. This is a dramatic sudden increase in voltage normally lasting only a few milliseconds. It could result in data corruption during a hard disk read or write cycle. It could also lead to a total component break down due to over-specified voltage. This is a situation when there is a total loss of mains power. It could bring about loss of unsaved current work. It may also bring about a possible loss of entire hard drive contents due to a head crash or disruption of the file allocation table. These may include a Surge, a Brown out where in you could have a decrease in supply voltage over a long time. All these could cause a great damage on your computer systems, including a total crash of your hard disk drive. This could lead to not only huge monetary loss, but data loss which might indeed be very damaging for your business. Thus preventing any such damages is absolutely essential. The best way to do so is by using an UPS. How your UPS may prevent any major damage? 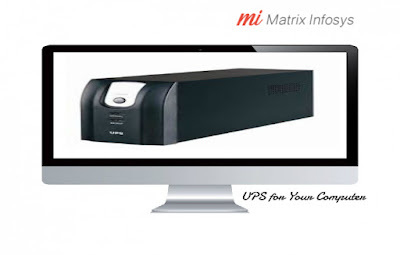 A UPS is something which works by regulating power to the electronic items you have connected to it .Thus it is vital in the event of power surges or brownouts as mentioned above. If there is a sudden power failure a UPS will alert you to the fact there is no power and depending on the size of the UPS can either shut down your computer or it could also let your computer keep on running. It could also alert you to the fact there is a power failure which will allow you to shut down your equipment yourself. This means that anything you are working on can be saved and then shut your computer down and it also means that in the event of any form of power surge your computer is protected from damage. In conclusion we can therefore see how the UPS can provide protection from any power related damages to your computer system. It must therefore function properly. It is because of this you need the regular servicing and repairing of your UPS. It is because of this important need that we at Matrix Service provide you with the best UPS repairing and maintenance services in Kolkata. To know more please visit our website. Power failures are such a bummers more so if you are currently working on a presentation. Keep your UPS up and running smoothly with the right UPS maintenance tips and have your current work be saved just before properly shutting your unit. Is it right to look for affordable computer repair service? Why the Laptop beep issue happens?